If music is your thing, then staying at Disney’s All Star Music Resort will make your trip to Orlando even more memorable. The hotel has no less than five themed areas each customized with a different genre - jazz, country, calypso, Broadway, and rock ‘n’ roll! There are quirky, instrument-shaped pools, a restaurant, bars and Wi-Fi access. 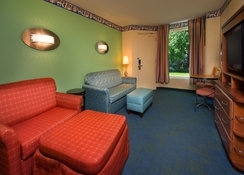 The accommodation also offers free transport to exciting Walt Disney World, Disney Springs and other attractions while guests can also avail of Disney Fast Pass and Extra Magic Hours which allow you into the theme parks early. 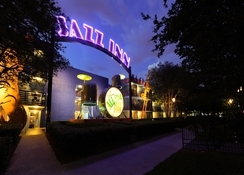 Disney’s All Star Music Resort is perfectly suited to families and couples who want to stay in a unique hotel will experiencing the rest of Orlando. 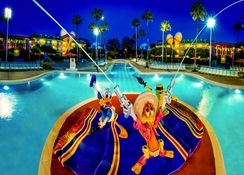 Disney’s All Star Music Resort is located Kissimmee which is just to the south or Orlando. It’s only 3 miles from Walt Disney Resort, 5.3 miles from Disney Springs and 2.3 miles from Disney’s Animal Kingdom and you can avail of the free shuttle service. Universal Studios (14 miles) and SeaWorld (10 miles) aren’t too far away while the Orlando International Airport is 23 miles from the property. There are 1818 rooms in total at the hotel, with three different room types available at the resort. Standard Rooms can sleep up to four adults and have two double beds while Preferred rooms also sleep four adults and are close to the dining facilities, Melody Hall and transportation to the theme parks. There is also the option of a Family Suite which can sleep up to six people and has one queen bed, sleeper chair, sofa bed and tin-size sleeper ottoman. All the rooms come with Wi-Fi, mini-fridge and ironing facilities. The Intermission Food Court is open for breakfast, lunch and dinner and has a range of cuisine to suit all ages. 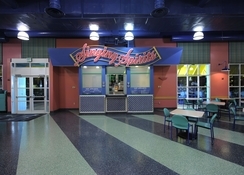 The Singing Spirits Pool bar has alcoholic and non-alcoholic drinks including unique cocktails and there is also a pizza delivery service if you are having a quiet night in after a fun-packed day at the parks. 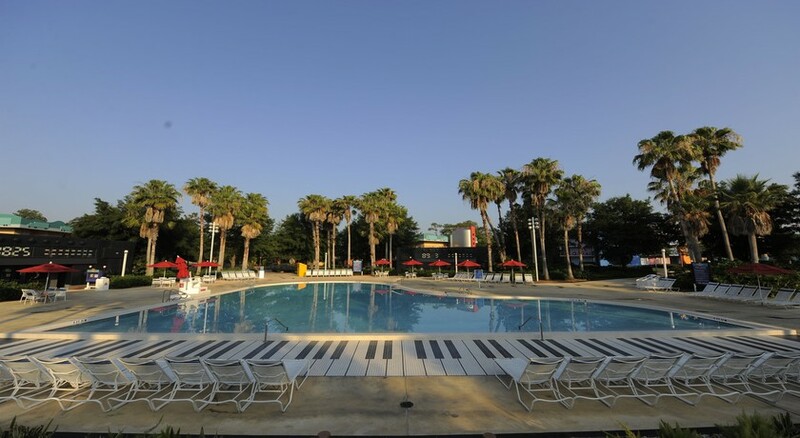 You will find two swimming pools at Disney’s All Star Music Resort which are designed in the shape of music instruments – a fun addition for the kids. There are also jogging trails, playgrounds and a game arcade on-site while you can also watch screenings of Disney Films in the great outdoors. Aside from the easy access to Disney and other theme parks in Orlando, you can also play golf in the nearby Lake Buena Vista Golf Course which is only 6 miles away and shoppers can head to the Lake Buena Vista Factory stores too.